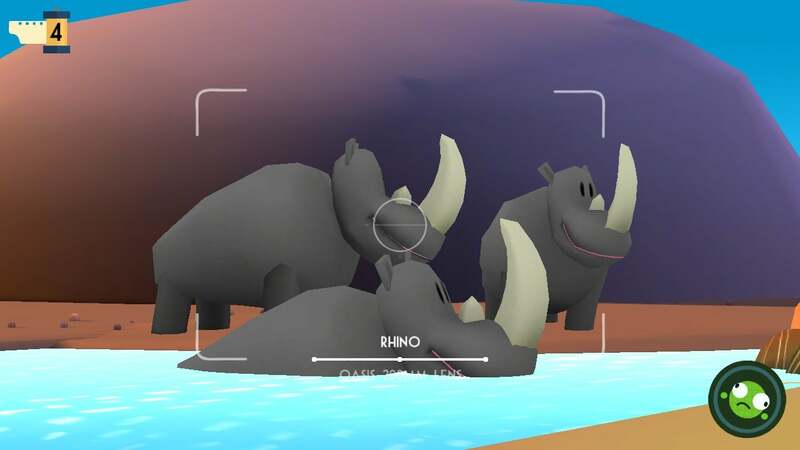 This adorable safari game will make you better at photography (maybe). Remember Pokémon Snap, the unexpectedly addictive photography game for Nintendo 64? Well, it’s back—in spirit—in Snapimals, a freemium game in which you try to capture wild animals’ wacky antics in still photos. Don’t you want to take pictures of adorable animals? Yeah you do. Snapimals’ premise is simple: Take photos of animals, open a museum, and become a world-renowned photographer. You’ll need to do all three of these things to succeed (where “succeed” means unlocking new content). You’ll start on the main island, dubbed “The Wilds,” with one shooting location available to you. 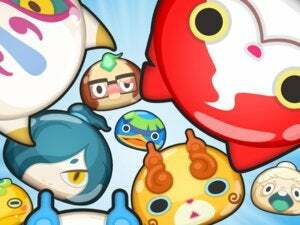 To level up, you’ll need to snap photos of animals in exchange for coins, which you can then use to expand your museum, unlock new shooting locations, and eventually open up new islands. Like Pokémon Snap, Snapimals takes you on an automatic safari: You’re propelled through the wilderness in some sort of automated vehicle, and your only job is to snap five excellent photos before your journey comes to an end. You can take five photos on each tour, but the Captain will only judge three. Each film reel offers five shots, so you can’t take pictures with abandon. At the end of your tour, you’ll be asked to pick up to three photos to be judged by the Captain, a boisterous bearded little man who serves as your museum mentor. The Captain will take a look at each picture’s composition and subject size, and deem your photos museum-worthy (“Captain’s Pics”) or postcard-ready. Museum-worthy photos earn you museum points and are displayed in the museum, while postcard pics are sold for a tidy sum of coins. If you think this game sounds boring, you’ve probably never played Pokémon Snap. But this game isn’t just for Pokémon Snap fans—it’s for everyone! Plus, it’s free (and there are plenty of ways to earn the game’s premium currency without dishing out real dollars). Here’s why you should give it a whirl. Adorable and addictive: I download a lot of games simply because the screenshots are cute—and Snapimals is one of those games. 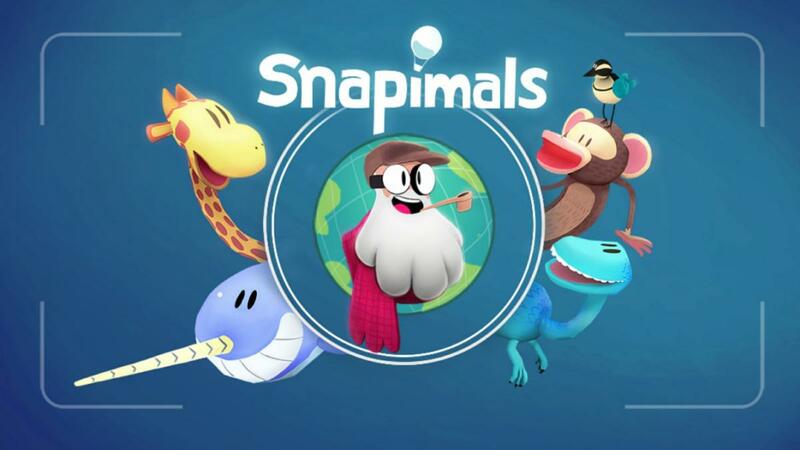 The graphics in Snapimals are bright, cheery, and totally adorable; the animals are cute and cartoonish with big heads, toothy grins, and funny antics and mannerisms you probably won’t find in actual nature. They don’t always do the same thing, either, so every photo tour in Snapimals is a unique experience. 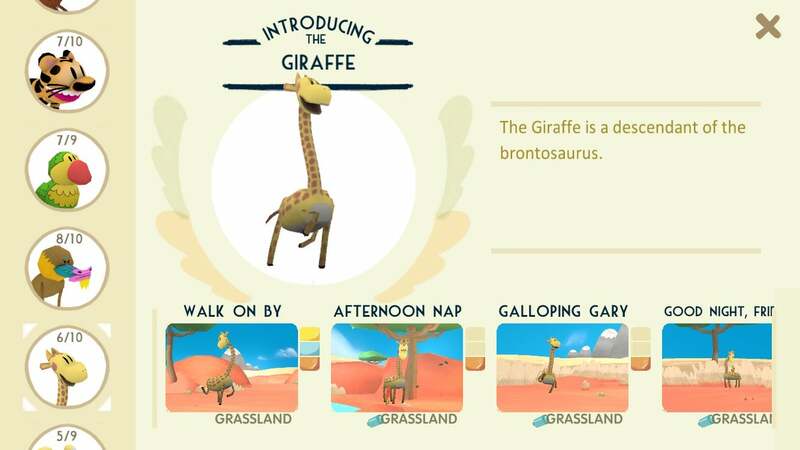 As you unlock each animal, you’ll be able to see their profiles, complete with tongue-in-cheek descriptions. In Snapimals, your goal is to take the best photos of the animals you find. It’s pretty standard photography: You want to take photos that are close-up (but not too close-up—the animal should fit inside the frame) and centered, and ideally the animal will be facing the camera and/or doing something cool. But it’s not just about capturing the perfect glamour shot—the Captain also wants you to grab some interesting snaps for his Captain’s Pics. These photos are listed on each animal’s profile page, though you’ll probably recognize these Kodak moments when you see them—like when you see a baboon riding a giraffe. Captain’s Pics are looking for the perfect action shot, not the perfect portrait, so you won’t necessarily need to get a close-up or centered photo of the animal in question to get a high score and a place on the museum wall. Well-paced: Each Snapimals shooting tour is about one minute long (including load time), and if you happen to use up all five film slots before the tour ends, you can opt to finish the tour immediately. This is the perfect pace for a casual game, because it means you can play a couple of levels without committing to an entire in-depth game. Snapimals is a freemium game, which means it’s free to play but if you get impatient you can purchase boosts or premium currency. The game is well-paced for a freemium title—you don’t need to spend money for a good experience, and there are plenty of opportunities to “earn” premium currency through daily challenges, video ads, and in-game achievements. 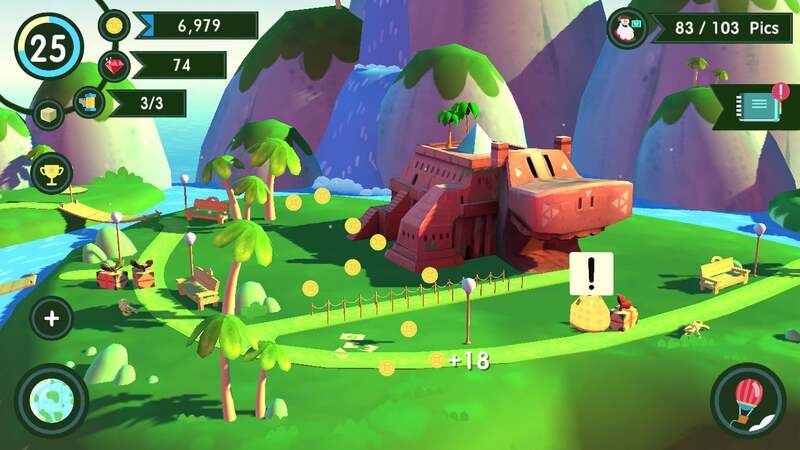 The game has three different currencies: Film rolls, which let you go on safari; coins, which you can use to upgrade your museum and unlock new buildings, islands, and levels; and gemstones, which let you speed up construction and purchase extra film rolls. Film rolls max out at three for free players with one reload every 30 minutes, so you can’t really waste hours on this game (which is probably a good thing). 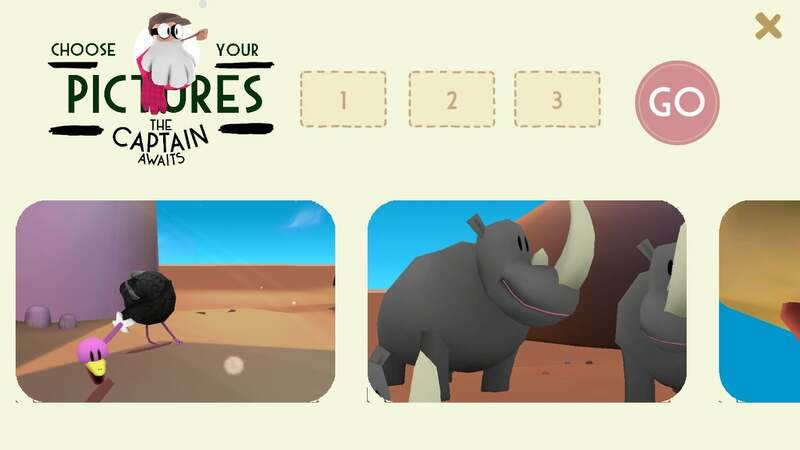 Mix it up: Snapimals is actually two games in one: It’s a photography game and a world-building game. You can go on safari all you want, but if you don’t upgrade your museum and island—which includes building ports, ticket booths, gift shops, bridges, and even a bank—you’ll be stuck going on the same safari over and over…forever. Building up your museum and the surrounding island(s), increasing your museum’s notoriety through excellent photography, and earning coins by completing goals, collecting from buildings, and picking up trash and gifts left by visitors will allow you to unlock new areas with new animals. Visitors leave trash behind, which you can tap for coins! I won’t lie—the world-building part of the game is pretty limited, since you can’t choose where buildings are placed, and most buildings must be built in a certain order. But it does give you something to do while you’re waiting for your film rolls to reload, and it can be quite satisfying to tap on buildings and random items for extra coins.